"This is a quick, throw together slow cooker soup with a Mexican flair. Teenagers love it. Serve topped with corn chips, shredded Cheddar cheese and a dollop of sour cream. Make sure you adjust the amount of chile peppers if you're sensitive about spicy foods." Place the ground beef, onion, chili beans, kidney beans, corn, tomato sauce, water, diced tomatoes, green chile peppers and taco seasoning mix in a slow cooker. Mix to blend, and cook on Low setting for 8 hours. This tasted just like chili and nothing like tacos. I won't be making this one again. 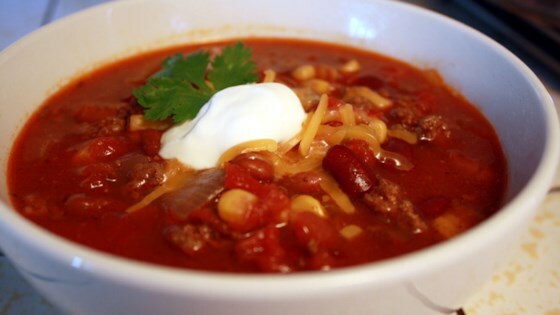 My husband is not a chili lover for some reason. What an awesome, simple recipe!! It can cook well over 8 hours, too. I made mine with ground turkey and the beef was never missed! Thanks for the recipe! This is a nice recipe for the winter! I like to use black beans instead of chili beans and ground turkey instead of beef. Yummy! Soup was very good. I also added the ranch dressing packet. I added too many green chiles and the family thought it was a little too spicy but very tasty.